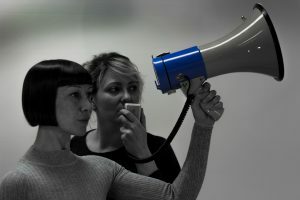 We’re almost ready to premiere our brand new show, The Audit (or Iceland, a modern myth), on Tues 27 February at Lancaster Arts. 10 years on from the 2008 financial crash – The Audit asks if we really weathered the storm? In making the show, we’ve spoken with academics working in economics, and with interest and community groups across the country to share experiences and discuss the profit making that is driving force behind the decisions and system that affects our daily lives. We’ve also had truly unbelievable support from Lincoln Performing Arts Centre, ARC Stockton, Oxford Playhouse, Lancaster Arts, hAb/Word of Warning, artsdepot, Tramway, Curve Leicester, and Arts Council England. Thank you for all you help – we’re looking forward to showing you what we’ve made.